Woodside Cottage is a detached two bedroom holiday cottage which has been tastefully converted from an 18th century mill. 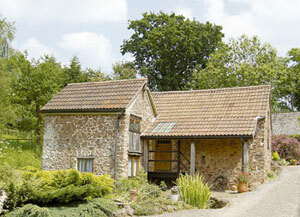 It is situated on a working farm which is also home to 3 other holiday properties. The farm has shared grounds of 30 acres, which consists of woodlands and meadows. The location is excellent being just 1 mile from the thatched village of Bicknoller with it's 15th century church, on the Eastern edge of the Quantock Hills. The accommodation is comfortably furnished. The lounge has very high ceilings with a sofa and 2 armchairs. The kitchen is well equipped including a table and chairs for dining. There is also a shared laundry room with a coin operated washing machine and tumble dryer. The bedrooms consist of a double and twin room and there is a separate bathroom with a free-standing iron bath. The owners allow pets in this cottage (2 dogs max).